Alderman Danny Solis (above) says Governor Bruce Rauner is pretty friendly for a "conservative, right-wing Republican." Governor Bruce Rauner scheduled time to meet with Chicago alderman Danny Solis on Friday, January 23, just a week and a half after he was inaugurated. Solis says a Rauner aide got in touch and asked him to have a chat in the governor's office at the Thompson Center. Like almost every other elected official in Chicago, Solis is a Democrat, while the governor is a Republican who campaigned by attacking entrenched Democratic leaders in Springfield. Still, members of the two parties have been known to speak before they start cursing each other's children, and the alderman welcomed the meeting. "I thought it was a good idea," Solis says. Solis says he sat on a couch in the governor's office as they talked casually and agreed to keep the lines of communication open. 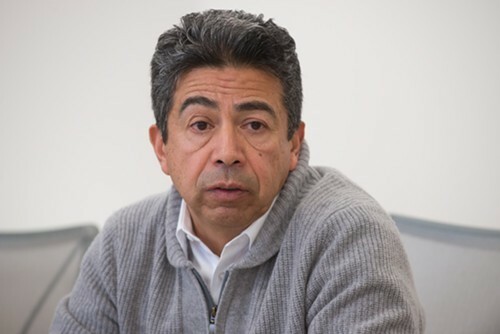 "He told me there were a lot of issues that we were going to have different positions on, and he understood that I would be publicly against him, and he would appreciate some contact with his staff," Solis says. When Rauner asked Solis for his input, the alderman says he advised him not to attack President Obama's immigration reforms, as other GOP governors have done. Rauner appeared to listen. "He is very personable," Solis says. Unless, he adds, you're house speaker Michael Madigan or senate president John Cullerton. Rauner is ripping them by name as he tries to turn the state budget impasse into a referendum on machine politics. "I feel that he is definitely a conservative, right-wing Republican," Solis says. "And on the issues I'm going to be more with the speaker and John Cullerton." While Rauner pushes his "turnaround" agenda of restricting union rights and workers' compensation, he's filled his daily schedule with meetings, briefings, and phone calls around the state. And he's made it clear that he's interested in hearing from a range of elected officials. That's the part of the story he wants you to know. Here are the parts he doesn't: the governor is also consulting people whose names he wants to keep secret. As Ben Joravsky and I reported this week, Rauner redacted more than 150 appointments from the copies of his daily calendar that he released publicly—and that's just for the first three and half months of his tenure. At the same time, elected officials from both parties are listed by name on his meeting schedule. But that's not all it appears to be either. Reaching out to legislators and local officials is something Rauner should do as the state's chief executive. It's also something he wants to do as the state's political blamer in chief: it allows him to claim the high road while blasting Madigan, Cullerton, and "the legislators they control" for putting politics ahead of Illinois. Several of the Democratic pols who met with the governor describe him as friendly and attentive—and committed to scoring points against the Democratic leadership. A couple weeks after his talk with Solis, the governor sat down with freshman state rep Pamela Reaves-Harris, another Chicago Democrat. She says she requested the meeting after Rauner proposed axing $6.7 billion from the budget, including funds for day care and mental health services. Reaves-Harris grew up in the former Cabrini-Green public housing development before working her way through the University of Illinois and becoming an attorney. "I wanted him to see me as evidence of what government can do," she says. She says Rauner seemed concerned when she spoke of how social service cuts would hurt people in her near-north and west-side district. But he noted that state finances are a mess, and "he made it clear that he has an issue with legislators who have made a career out of politics." Reaves-Harris argues the state needs to bring in more money, yet the governor won't discuss it while his probusiness proposals flounder in the Democratic legislature. "Most of the conversations he's having in the public are more about his turnaround agenda, and I have a problem with him holding the budget hostage." Cook County commissioner Richard Boykin also made the governor's appointment calendar, on March 13. Boykin says he too requested a meeting so he could ask the governor not to cut mental health funding. He was pleased when Rauner agreed to declare May 31 "No Stigma Sunday" as a way to encourage people to seek help for mental health issues. "He not only responded to me verbally—he responded in deed," Boykin says. But when May 31 came around, the governor was fighting with Madigan and Cullerton as the deadline to pass a budget came and went. His office didn't even send out a press release about "No Stigma Sunday." Boykin argues that legislators should give the governor something he wants—as long as he agrees to sign off on a tax increase on the wealthy to pay for social services. "That's called compromise."